Image: Manny Rodriguez/Blend Images/Getty Images. To everyone pranking their parents leading up to Thanksgiving — texting, “How long do you need to microwave a 25-pound turkey?” and posting screenshots of their parents’ hilarious responses online — it turns out, the joke’s actually on you. Apparently, it is possible — and safe — to cook a turkey in the microwave, at least according to the United States Department of Agriculture Food Safety and Inspection Service. No, it’s not safe to cook a 25-pound turkey in the microwave, but a 12-pounder? Yep. Now, before we actually get into how to pull it off, we’ll just say that if you can cook the turkey in the oven, on a grill or in deep fryer, please, please, for the love of God, opt for those methods first. Because really, a microwaved turkey? Of course, if the microwave is your only option, do yourself a favor and do it the USDA way. “Just as a detour causes a driver to find an alternate route, circumstances can alter the chosen cooking method for a turkey. An oven may fail at an inopportune time, a power outage may occur, and more than one large food item may need cooking,” the USDA’s guide, “Turkey: Alternate Routes to the Table,” states. 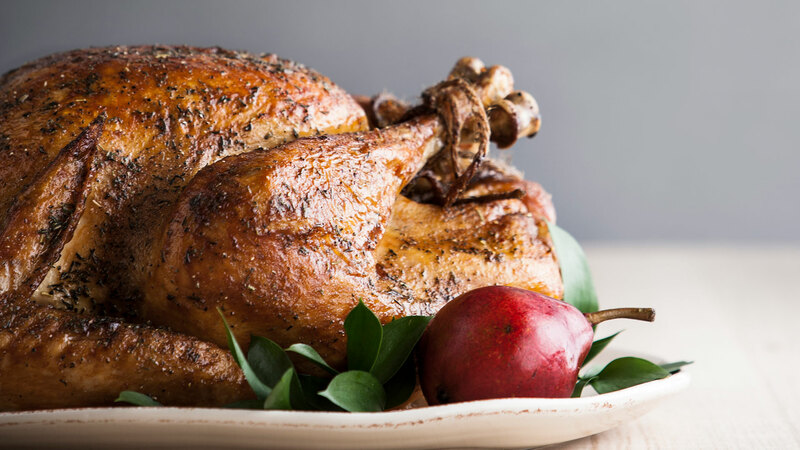 The guide covers all possible methods: electric roaster oven, grilling a turkey, using a covered gas grill, covered charcoal grill, smoking a turkey, deep-fat frying, cooking an unstuffed turkey from the frozen state, slow cooking a cut-up turkey and cooking turkey in a pressure cooker. The USDA advises against microwaving two types of turkeys: a frozen turkey or a stuffed turkey. “The stuffing may not be cooked to the proper internal temperature when the turkey itself is done,” the USDA states. But if you defrost the turkey in the microwave, cook it immediately. Don’t put it back in the fridge or let it sit on the counter. As far as microwaving a turkey that isn’t stuffed or frozen is concerned, the USDA does state you can cook it whole or in parts, and microwaves can accommodate a 12- to 14-pound turkey. “Turkey parts can be cooked in a dish with a lid, or cover the dish with plastic wrap and vent the top,” the USDA states. Before you toss the turkey in the microwave, encase it with an oven-cooking bag. This will help cook the turkey evenly. Once the turkey’s in the bag, ensure you leave 3 inches of oven clearance on top and 2 to 3 inches of space around the bird. Here’s the fun part: timing. Timing can vary because of wattage differences, and this is when you’ll want to refer to the owners manual. (Good luck digging that bad boy out.) Once you’ve figured out your microwave’s wattage, the cooking time is 9 to 10 minutes per pound on medium (50 percent) power. Be sure to rotate the turkey during cooking to ensure even cooking, and always use a food thermometer to determine doneness. It should reach a minimum internal temperature of 165 degrees F in the innermost part of the thigh and wing and the thickest part of the breast. Once it’s up to temp, remove it from the microwave. Then, let the turkey stand for 20 minutes before carving into it. And there you have it: a safe way to cook a turkey in the microwave.